Throughout higher education, data analytics is playing an increasingly important and game-changing role in student advising. Campus leaders are looking for successful models as they approach initiatives on their own campuses, to employ data analytics in student advising programs. Syracuse University provides such a model. 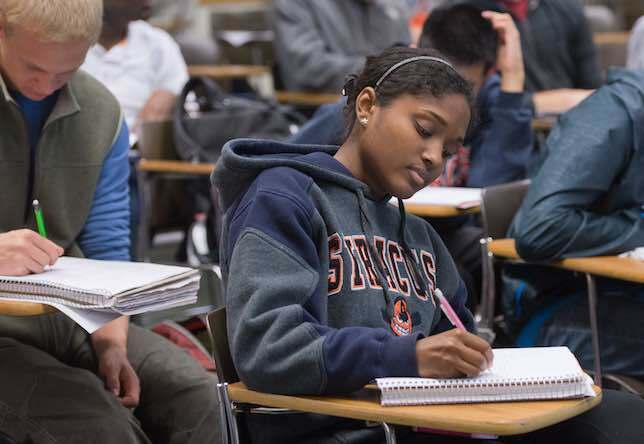 In alignment with its 2015 academic strategic plan, Syracuse conducted a university-wide overhaul of its advising practices. Its "Orange SUccess" initiative would implement a new, centralized student advising system, provide intrusive advising, improve student persistence, and enable the sharing of data seamlessly across all schools and colleges. By nature, an initiative of this type is built on the latest technology. But for Syracuse, technology is always looked upon as a path to a solution; not a driver of change in itself. Here, Campus Technology asks Kalpana (Kal) Srinivas, the university's director for retention, in Academic Affairs, how Syracuse streamlined the process of advising across all schools and colleges, and why understanding campus culture was central to her team's change management strategy as their thought-led initiative analyzed all the underlying business processes across the entire university. "Always keep in mind, though: It's not the technology — it's the people." Mary Grush: Where are we now, in higher education's adoption of data analytics in student advising? Kalpana (Kal) Srinivas: Student advising has always been considered the linchpin of retention, a critical area for higher education institutions. And our retention gurus have held for years that it's important that a student's advisor is one of the key people they build a relationship with. Data analytics may seem to be a more recent phenomenon, but it's now over 10 years since EDUCAUSE began publishing articles suggesting that if colleges and universities can place more and better information into the hands of a greater number of people, this enables better decision making. These two factors together became the crux of our understanding of how important it is to get critical information into the hands of advisors, so that they can do the holistic student advising we are asking them to do. Grush: So is there more of a focus now on data analytics in higher education, since it's finding a niche in student advising? Srinivas: The overall picture of data analytics in higher education has taken shape mostly in the past five years, and the scholarship on this topic has really exploded recently. Linking data analytics with student advising and the science of that is a relatively new phenomenon: Even though higher education has been collecting data on students for decades, especially via student information systems, most of that data has not been used to its full potential. Concurrently, there has been increasing pressure to promote timely degree completion and increase student success and graduation rates. We know that student success can be improved when students, faculty, and staff are on the same page. How can we achieve that? It's possible when we leverage data-informed decision making in student advising. Grush: Is data analytics becoming established as a technology that higher education can use to solve our problems? Srinivas: Well, that's not the whole picture, of course. In higher education, we do feel the need to work smarter and to break down the silos across our institutions. The impact of data analytics in solving some of these problems can be huge, and its application in student advising is impressive. But, we have to remember that the technology is not what's driving the improved utilization of data for hypothesis-driven data mining. Such initiatives are actually guided by communities of practice — communities within higher education, such as NACADA, which in 2016 published a guide to implementing data-informed advising. So, given research-based approaches to the science of data analytics, technologies have evolved to help as higher education conducts data-informed decision making in many areas, especially advising. Always keep in mind, though: It's not the technology — it's the people. Grush: How do the vendors participate in this area of data analytics and student advising? Grush: Typically, are higher education institutions 'ready' for change in these areas? How important is it for institutional groups considering initiatives to address their own campus culture and be truly aware of whether the institution is ready for some of these changes? Is there a danger that some institutions will be blind-sided or swept along without the proper foundation for change? Srinivas: Technology has revolutionized higher education. We've all seen this happen over the past several years. So now, many institutions are stepping up and leveraging advising systems to support students with early alerts and online scheduling, by integrating their SIS data. The fact, though, is that institutions must be ready for change now. Working in silos is just not effective anymore. Pen-and-paper, and Excel worksheets — where good data often goes to die — will ultimately reveal this fact to institutions. They will find out that they are in need of real change. We can't just hold on to what has worked in the past. And it's only through the enterprise systems, where everybody is on the same page, and where the enterprise system serves as a hub of information that can move things real time, that students will get the support they really need today — before they feel overwhelmed. Grush: So in general, how is higher education doing with managing these changes? How did your team at Syracuse manage change? Srinivas: Even though the record on delivering results is still not very good according to our change management gurus, there is still reason to press for change. What institutions need to do is embrace change management principles, as we did at Syracuse. Among other change management strategies, our team used John Kotter's Eight Stage Process for Creating Major Change (1996) to increase acceptance and adoption on campus. And as we made the transition from pilot to a full campus rollout, we continued to focus on the "why of the what" in order to win both hearts and minds as we worked for a shift in culture on campus. We implemented our Orange SUccess initiative in a way that would inspire, create, and maintain trust. And that's a strategy for the long term. Srinivas: Yes, and culture is not one aspect of the game… it is the game. 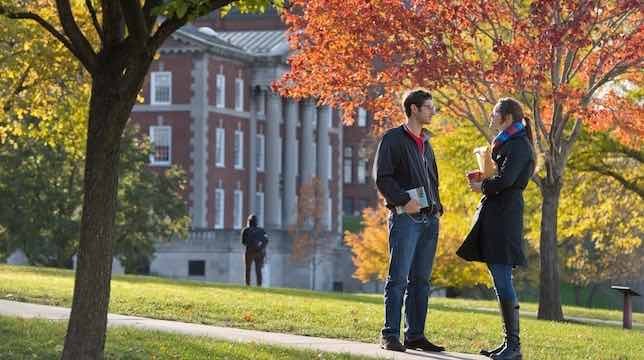 So, we need to understand what our university stands for: What are our values? 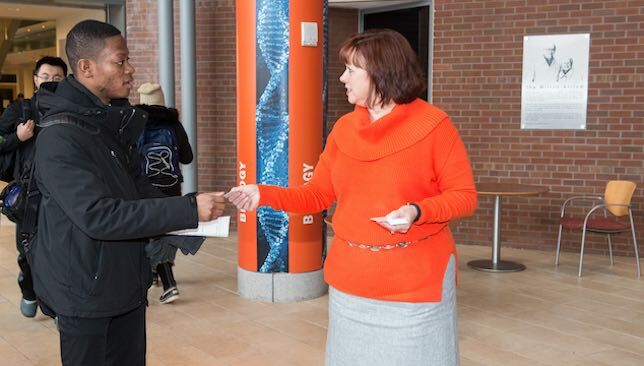 At Syracuse, students are our highest value. We are trying to serve our students. Our chancellor and president, Kent Syverud, has a very good mantra that we like to display as a sign on our desks, saying: "…And this would be good for students because…?" So, we ask ourselves how any implementation that we do brings value to our students. Grush: How did you learn from the cultural history of your campus as you approached your Orange SUccess initiative? Where did you look, and who did you ask? And how did you form your team? Srinivas: We had numerous conversations across campus to learn from the history of earlier implementations — what had worked, yes, but especially what had not worked. Why had some implementations settled for a diluted version of performance? Which systems had low adoption rates? Upon his inauguration back in 2014, Chancellor Syverud had put in place a "Fast Forward" exercise to examine the status quo. It revealed a need for more systematic data about academic progress. We involved faculty, students, and staff, from all schools and colleges, to consider the importance of creating an enterprise wide system for the future. So I could say, we involved everyone as our partner. We created shared goals to improve student success on campus, and we built a guiding coalition. We emphasized enterprise benefits over departmental tradeoffs. And as for our implementation team, Academic Affairs worked hand-in-hand with Information Technology Services — the backbone of any technology implementation — as equal partners, to kick off Orange SUccess by January 2016, have it up and running for all undergraduates by Fall 2016, and then available for all graduate and law students by Spring 2017. Grush: Going forward, what is your most challenging goal and your approach to achieving it? Given the enterprise advising system you now have in place, how will you develop ongoing processes that will continue to work, campus-wide? Does it 'take a village'? Srinivas: That's a really big, far-reaching question. We are trying to build synergy and enhance collaboration between Academic Affairs and Enrollment and Student Experience (which was called Student Affairs in the past). We want to advance a robust and seamless approach to the learning, counseling, engagement, and development of the whole student. We'll continue our strong collaboration of Academic Affairs with ITS, as we maintain our ongoing work with all our collaborators across campus. And yes, it takes a virtual village. Grush: What has been most impactful, when you look back at the cultural changes you've seen? Srinivas: Our work has created both a cultural change and cultural accountability. As we all know, accountability is a measure of, or even the equivalent to program effectiveness. So an increase in accountability is what I'd want to point to. But we have time ahead to measure our effectiveness. We don't want to jump the gun in terms of what we claim to be success. In reality, we are still early in our implementation cycle, because we have only had the system running for five semesters, including the pilot. We are working with our institutional research group to ask the right questions that may give us reasonable measures of success and of Orange SUccess's impact on students. The technology we implemented is both high-tech and high-touch. But we still have to reflect, again and again, that technology is only a tool that makes tasks easier for students. It's the people that actually support the students. That has to be in the DNA of the system. We'll find out. We still have so much to do, ahead of us.